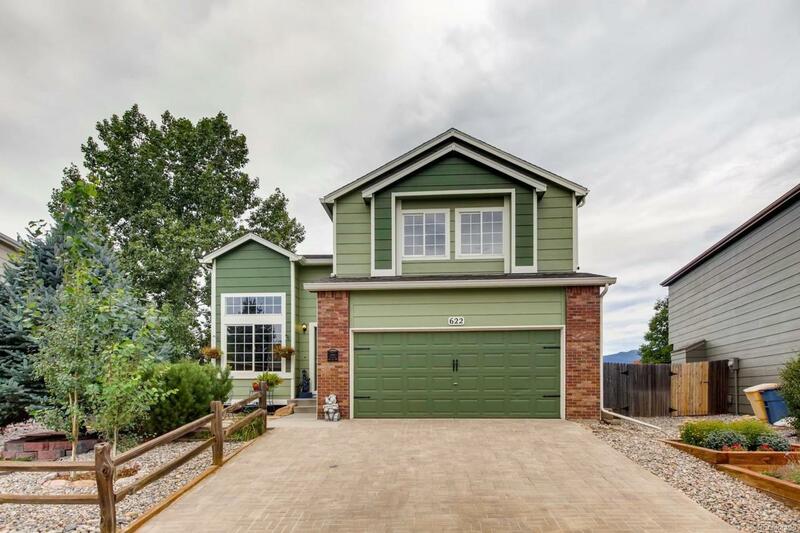 This beautiful home welcomes you with a bright & open design with staircase to the 2nd floor & an airy feel when walking through the living room with vaulted ceilings. Just off the living room is the kitchen that features wood flooring, appliances & plenty of cabinet & counter space. The kitchen is opened up to the dining area with walkout to the backyard & the spacious family room with gas fireplace, the ideal area to entertain your family & friends! Upstairs you will find the Master Suite that features a sitting room w/ gas fireplace & built ins, walk in closet with cedar flooring & master bath. To complement this upper level are 2 additional bedrooms & bathroom. The finished basement features an additional bedroom, bathroom & a rec room! Enjoy your beautifully landscaped backyard with the view of the mountains! This home is just minutes away from Peterson AFB, Fort Carson & Schriever AFB, close to the Powers Corridor. Dont miss out on this fantastic home, it is a MUST see!